The strength and depth of the male restricted aged greyhounds in New Zealand this season is graphically illustrated by the five classy fields that has been drawn to contest Thursday evening’s 457m heats for the $46,000 Mike Stent Decorators New Zealand Derby at the Cambridge Raceway. Competitive racing is assured as just to qualify for the April 18 Group 1 final will be a major achievement in itself. It’s a full evening of chasing action as there are also 747m and 457m heats for two other Group 2 races on the card. Here’s a look at the Mike Stent Decorators New Zealand Derby heat contenders, along with their respective TAB Futures quotes (winner of the final). 1 Manooka $26: His qualifying claims has been enhanced after receiving this trap. He boldly chased after the pacemaker in last Thursday’s Adding ton C5 520m event. Holding the rail here is the key to his claims here. 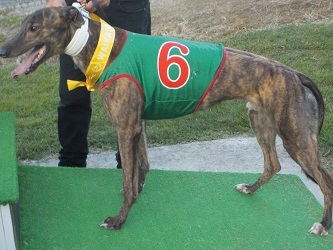 2 Thrilling Amigo $9: He’s a locally prepared chaser from a strong kennel. He owns competitive 457m stats around this big spacious circuit and his draws says a competitive effort can be expected from this holder of a best 25.68s 457m time. 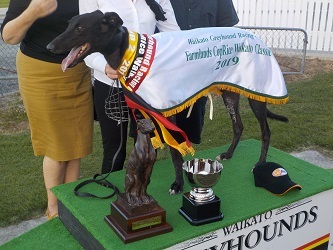 3 Trojan Hoarse $14: He can be forgiven his April 1 Manawatu 457m miss. He is generally sighted contesting the pace and his advancement claims cannot be lightly dismissed if uses the known early pace he owns here. 4 Fare Dodger $81: He’s had one 457m race on this track for a miss. The concern for him is his wide racing tendencies, especially when rounding the turn. He has been known to jump onto the pace, which is a tactic he must use here. 5 Gao Gao $126: He was bold when he was sighted running on during the run home to land his Sunday 30.70s Manukau C3 527m win. This is a tougher assignment and he cops a tough draw for it. 6 Bigtime Brody $31: He’s a lightly raced chaser who has been displaying a fair amount of potential. His pace making last start 30.16s 520m C2 win illustrated the promise he owns. Being on track debut here is the concern for him. 7 Opawa Viking $21: Completely overlook that he was sent over the Addington 295m dash (C4) in his last outing. He was the runner up in the February 520m NZ St Leger (Group 1) and he has delivered competitive 457m races on the similarly shaped Ascot Park track. 8 Billy’s Churn $81: He found himself jammed up in midfield traffic during his Monday Manawatu C3 410m sprint after winning his prior 410m C2 dash there in 23.50s. His previous Cambridge 457m race saw him finishing fourth in a NZRS Graduation heat. Reserves – 9 Sailor Allen $61: He’s a C1 assessed chaser who trialed over the Addington 295m dash in a swift 17.17s when last sighted on a track on February 8. His prior race was a close up Ascot Park C1 457m second. 10 Sir Kinloch $151: He was denied racing room when going into the first turn during his Sunday C1 527m outing. Take a look at him in the race 2 C1 457m event if he doesn’t gain a race start here. 1 Bigtime Rod $61: He downgraded back to C3 to deliver his two length Friday 520m third. He has compiled sound looking stats from this trap and jumping onto the pace can see him featuring for a fair way here. 2 Shaw Lee $61: He’s a Canterbury prepared chaser, who is better known over the short course sprints as seen in his last start Forbury Park 18.90s C4 310m win. He peaked on his gallop in his pair of 520m and 457m races earlier in his career. He’s on track debut here. 3 Frosty Blaze $151: He made his track (and his northern) debut for his new trainer in a C1/2 457m event last Thursday, when he was impeded when leaving the traps. He’s facing a tough task in this line up. 4 Bigtime Rocco $41: He was setting the pace during his track debut in a C4 457m event last week when he was dragged from behind, losing his claims. He owns untapped potential and an on the pace effort can see him making things rather interesting for a long way. 5 All Black Star $101: He’s a C4 graded chaser who suffered from traffic problems in his last start Manawatu C4/5 457m outing. His prior race was a C4/5 457m event here where he didn’t receive any racing favours during the run home. He can and he must contest the pace. 6 Ringside $8: He accepted a clear racing passage when rounding the first turn to scamper clear when landing his easy Thursday Addington C5 30.06s 520m win. His talented is illustrated by him being the recent Auckland Cup final runner up. 7 Go Brat $26: He kicked on during the run home for his 6.75 length Addington C5 520m third last week behind race rival here Ringside. He has visited this track twice before when he delivered a bold 457m Group 2 heat second. 8 Robson $8: He’s returning to his home track following his exciting 25.78s 457m victory in the $28,000 Golden Chase final. He commands obvious respect and drawing out here provides him with sound looking swooping claims. Reserves – 9 Lacko Allen $81: He’s a C1 graded Canterbury chaser who suffered from an impeded racing passage after he made a moderate start during his track debut last Thursday in a C1/2 457m event. 10 Dyna Frankie $61: He’s a recently imported C1 assessed Aussie chaser who will be making his NZ debut if secures a race start here. He trialed over the Hatrick 305m dash in 17.63s last Friday. 1 Jinja Shake $41: There’s no questioning his race fitness for this assignment following his Thursday pace making Addington 645m win. He was C1 graded when he finished second in a December Group 2 457m heat here, but didn’t take his place in that final. 2 Thrilling Vice $8: This bloke has been on a 457m winning spree having stylishly won his last five races over the trip. That includes a real smart 25.48s clock. Drawing this trap has further enhanced his qualifying claims here. 3 Famous Lee $41: He travels north after delivering his 2.75 length Addington C1/2 520m second to race rival here Know Refusal last Friday. He has to place himself straight onto the early pace when the traps lift here. 4 Know Refusal $51: He controlled the pace throughout when he scored last Friday in an Addington C1/2 520m event in 30.39s. He must use those same pace making tactics during his track debut here. 5 Bigtime Pete $41: The question that surrounds the Manawatu 410m track record holder is how strongly will he run out this 457m trip. He fell in to win over the distance in 26.38s in Palmerston North two races ago. He must lead out here. 6 Heart Shaped Box $51: He has recently been downgraded from the open class chasing ranks. He’s a handy locally prepared chaser who tends to race on the pace during his 457m outings around here. 7 Tianyu $51: He was sighted doing his best work at the business end in his latest Manukau C4/5 527m races. That includes his 30.75s win there two races ago. He isn’t exactly the quickest into stride, however he does own sound looking trap seven stats. 8 Bigtime Alfie $61: He’s returning here after his recent traffic impeded C2 Manawatu 457m races. Those misses came from inside traps. He looks better suited drawn wide, however he must contest the early pace here. Reserves – 9 Bold Diesel $251: He’s an inexperienced C1 assessed chaser who was checked when heading into the first turn over 527m on Sunday. He’s better suited to racing in the C1 457m race 2 event here. 10 Sailor Allen $61: He’s a C1 assessed chaser who trialed over the Addington 295m dash in a swift 17.17s when last sighted on a track on February 8. His prior race was a close up Ascot Park C1 457m second. 1 Kamada Park $51: He’s a known strong finishing chaser over 457m who is likely to relish drawing this trap as he tends to race handy to the rail. He stayed back in the field during his Monday C3 457m outing after his tidy prior pace making 660m win there. 2 Know Betrayal $41: He’s a C4 graded Canterbury chaser who finished solidly to nail his last start 32.72s Forbury Park C2/3 545m win. The jump will be the key to his qualifying prospects – this trap can assist him. 3 Thrilling Talk $3.50: He’s unquestionably the greyhound to beat in this series. He’s a Group 2 457m winner on this track (won in 25.43s). His remarkable consistency at this venue can be gauged by the three swift 25.42s 457m times he’s posted here. 4 Cameo Syd $21: He’s a competitive northern based open class chaser who delivered a bold 4.5 length 457m second to Thrilling Talk here four races ago. He’s likely to be sighted racing in the middle of the track here. 5 Bigtime Tank $41: This fella has quietly advanced through into C4 ranks while delivering consistent efforts. There’s nothing flashy about him, however his determination cannot be faulted. He cops a rough draw here. 6 Our Brad $41: He dictated the pace to his rivals when he delivered his Friday 30.71s C1/2 Addington 520m win. He has produced a 30.12s best Addington 520m time that came when he led home race rival here Know Betrayal by a four length margin. 7 Bigtime Leads $41: He had downgraded back to C3 when he got caught up in early traffic and never received clear racing room over 520m at Hatrick last Friday. He did lead a Manawatu C4/5 457m race for a long way in his previous start. 8 Cheese And Chalk $41: He set up the pace, then he was hauled back in over the concluding stages when winding up a two length Hatrick Friday C3/4 520m second. His wide trap stats makes for rather tidy reading. 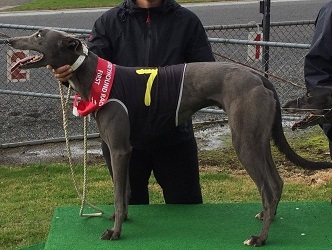 Reserves – 9 Dyna Frankie $61: He’s a recently imported C1 assessed Aussie chaser who will be making his NZ debut if secures a race start here. He trialed over the Hatrick 305m dash in 17.63s last Friday. 10 Bold Diesel $251: He’s an inexperienced C1 assessed chaser who was checked when heading into the first turn over 527m on Sunday. He’s better suited to racing in the C1 457m race 2 event here. 1 Sub Eighteen $51: He fronted up to this venue last Thursday to contest a C4 457m event from this trap. He lost all claims when he copped a whack going into the turn. He is proven from this trap, therefore allow him another chance here. 2 Double Speed $51: He returns to this track after he delivered a sound last start 2.25 length Addington 520m second in a $12,000 NZRS Advanced final from this trap. He jumped handy to the pace then and he must do likewise in this heat. 3 Mr. Matt $41: He didn’t receive any early racing favours during his last start Addington $12,000 NZRS Advanced 520m final. He’s more than capable of being able to feature here, however he must place himself onto the early pace to achieve that. 4 Suspicious Minds $51: He’s better known as a proven 375m sprinter at this venue. In saying that he has won over 457m here (25.83s) and if he uses his known early pace, then he can make things look rather interesting for a long way here. 5 Buddy Loaded $51: He pressed on late for his Monday 5.75 length Palmerston North 457m third when he ran out his C2 nominations. He was bold in his prior outing when finishing a 2.9 length fourth to race rival here Diddilee in a feature Manawatu 457m event. 6 Diddilee $10: This bloke already has two Group 1 trophies safely tucked away in his kennel this season. That factor alone says he demands total respect here. His track form here isn’t the best, however he’s a more mature greyhound now. Track sense is a great asset he owns. 7 Spring Mechanic $18: He stylishly claimed two Addington C1 520m wins last week to secure his place in these heats. His talents cannot be ignore as seen in his searing Addington maiden 29.96s 520m win. He can be forgiven his 457m miss here three races ago. 8 Bigtime Jetty $51: He led on the turn, then he was gathered in by 0.8 of a length in his last Manawatu C4 457m outing, which came from this trap. His only 457m race here came when he was run down late when he was making his race debut. Reserves – 9 Sir Kinloch $151: He was denied racing room when going into the first turn during his Sunday C1 527m outing. Take a look at him in the race 2 C1 457m event if he doesn’t gain a race start here. 10 Lacko Allen $81: He’s a C1 graded Canterbury chaser who suffered from an impeded racing passage after he made a moderate start during his track debut last Thursday in a C1/2 457m event.